I can not believe that I reached 100 posts. I didn’t start my blog until January of this year but I made a goal of 3-4 blog posts a week to keep consistency and I have met the goal and sometimes exceeded my goal. 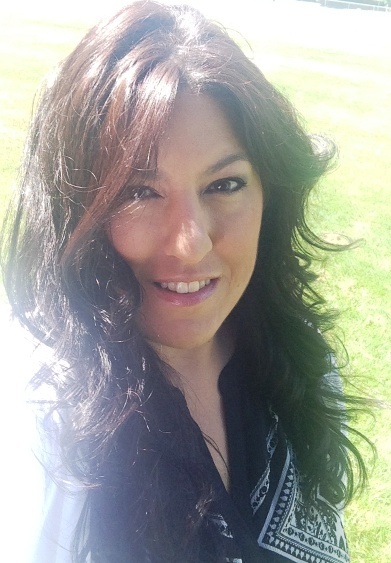 More than just writing consistenly, I have enjoyed writing it! The friends I have met, the recipes I have shared, the DIY projects I have made all made it so totally worth the time we put into our blogs. I can’t even begin to thank those of you who read and follow along on this little ol’ blog of mine. To those who read but don’t comment, to those who comment everyday, to those who read even though they have almost no free time to themselves but take the time to read..THANK YOU, THANK YOU, THANK YOU! Speaking of recipes I have a quick one for you today! I originally wanted to do an Orange Chicken recipe but I need to work on it some more to make it right. 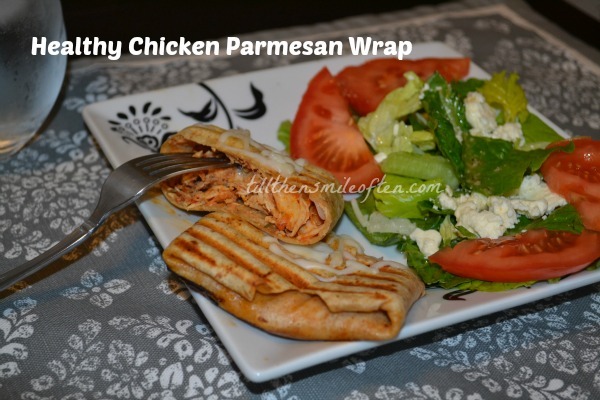 So I decided to make this Chicken Parmesan Wrap after seeing it on Pinterest here. The wierdest part is that you have to click on the link for the “directions” and it takes you to Candace Cameron-Burre’s blog. You know from Full House? So random. 1. If using pre-made chicken, re-heat. Cut into chunks or strips. 2. Add sauce and chicken to a small bowl and add spices. Stir to combine. 3. 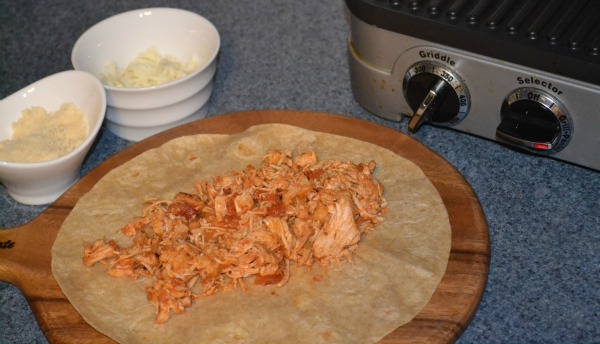 Place chicken and sauce to the center of a wrap. 4. Sprinkle parmesan cheese on top of chicken, then the mozzarella. 5. 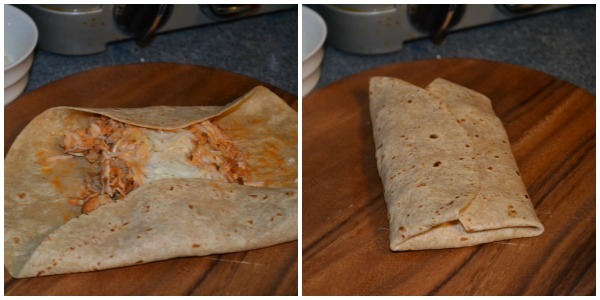 Fold wrap like a burrito. 6. 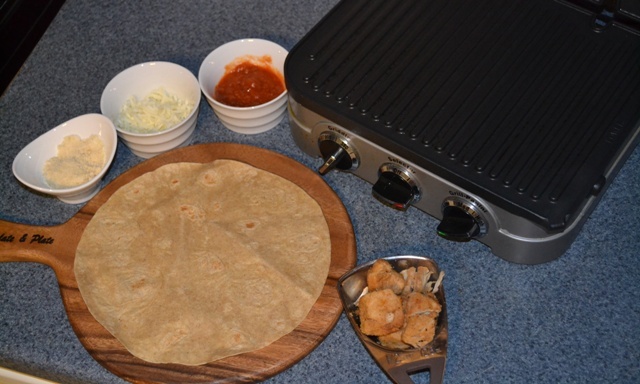 Grill on a panini press, grill, or grill pan. 7. Cut in half and enjoy! What are you cooking up this week? Head on over to Jessica and Ashley to see what others are making! Thank you so much Tori! It means a lot that you said that, and for all your comments. I truly appreciate every one of them! This looks good! Love the idea of grilling the wrap. And that is so weird about Full House. Ha! Small world. Thanks Amanda! It was so random landing on her sight for sure! I totally thought I was crazily clicking on random things but nope. Very small world! 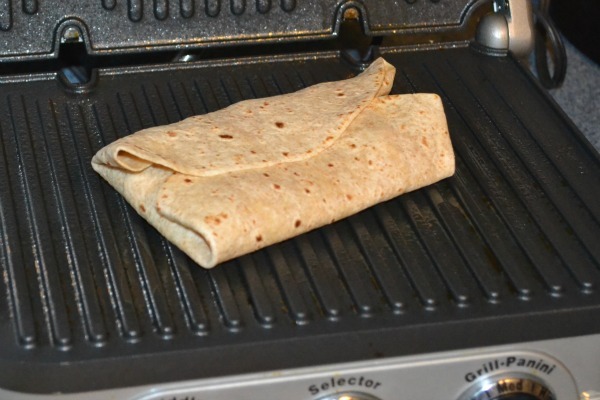 This wrap looks amazing and I would have never thought to heat it – YUM!!! Can’t wait to try this! Thanks Jessica! I can’t believe I got to 100, but hoping for many more! I loved grilling it, the crunch added just a little something extra! Oh man!! This looks great!!! Thanks Sarah! I hope you try it! I was horrible when I first started blogging then I took it more seriously in January. Sometimes life gets in the way so I know what you mean! Hope you try it it was really yummy! 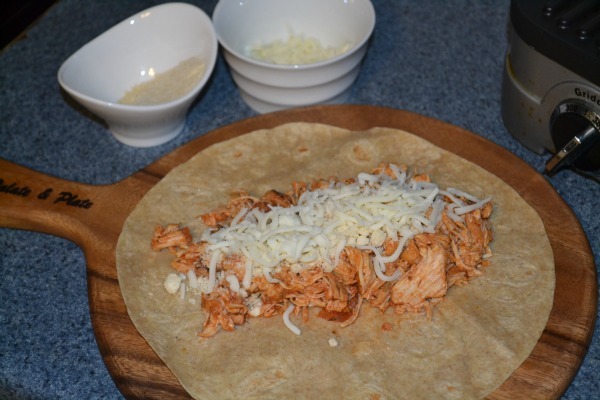 I love wraps… I could eat one every day for lunch. Thanks for linking up this recipe. I followed that “link” to Candace’s blog… weird!